Vegan ginger teriyaki stir fry is a delicious plant-based dinner or meal prep recipe that is ready in under 30 minutes! 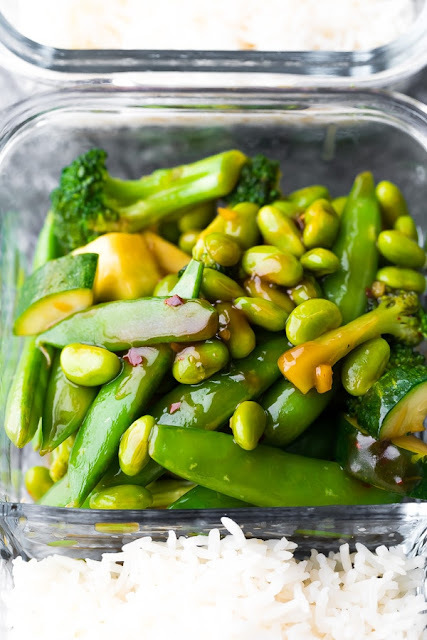 Veggies and edamame are cooked up in a sticky sweet and savory vegan teriyaki sauce. This vegan ginger teriyaki stir fry post has been in the works for quite awhile now, as I’ve been working on mastering my homemade teriyaki sauce. You can buy the bottled teriyaki sauce, but you will be hard pressed to find one that is vegan and free from additives with crazy-complicated names. So I’m kind of excited to be sharing my vegan teriyaki sauce recipe with you today! This sauce tastes just as good as the bottled stuff, but it is made from clean ingredients you probably already have in your pantry. Not only that, but you can have it prepped in under 5 minutes. How easy is that?! And I tested this vegan teriyaki sauce with tamari as well to make sure it really does taste the same if you want to make it gluten-free. This vegan teriyaki stir fry is sticky, sweet and savory, and a little bit spicy. And it is totally filling and satisfying, but not in an over-full way. Perfect for a weeknight dinner or meal prep lunch! Shake together all vegan teriyaki sauce ingredients and set aside. Add the vegetables and edamame. Cook for 5-7 minutes, stirring occasionally, until softened (but you still want them to be a bit crisp). Give the vegan teriyaki sauce a good shake, then pour into the pan. Cook for 1-2 minutes until sauce is thickened and all veggies are coated. Portion stir fry out into meal prep containers along with 1/2 cup portions of cooked rice. 0 Response to "Vegan Ginger Teriyaki Stir Fry (Meal Prep) "